Integrators entered 2017 with a positive outlook on the industry. During 2017 we saw the race to the bottom hit bottom, cyber security vulnerabilities rampant, and challenges in the SMB market, a key segment for many integrators. 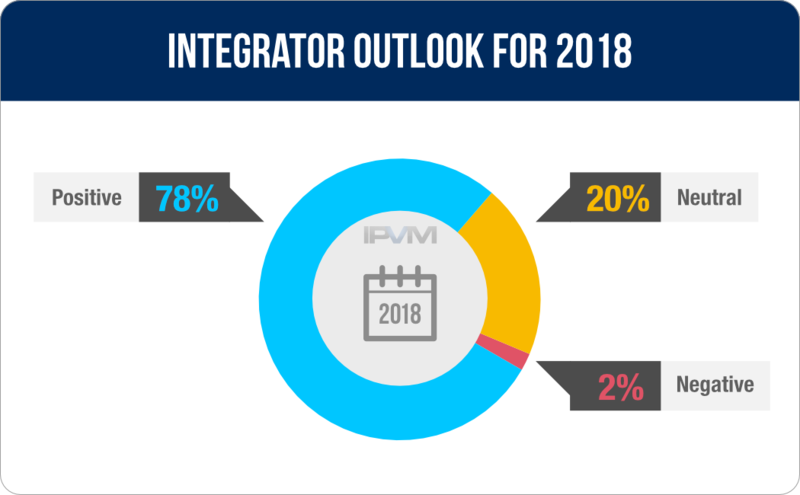 New IPVM statistics based on 130+ integrator responses show the outlook for 2018. Integrators remain extremely positive going into 2018. Multiple reasons were given for this positive outlook, which we detail below. *********** ******* **** **** a******** ******* ** *** industry. ****** **** ** saw*** **** ** *** bottom *** ******,***** ******** *************** *******, ************* ** *** *** market, * *** ******* for **** ***********. *** IPVM ********** ***** ** 130+ ********** ********* **** the ******* *** ****. *********** ****** ********* ******** going **** ****. ******** reasons **** ***** *** this ******** *******, ***** we ****** *****. ***** **** ******* *** negative ******** ****** ** cite *** **** ** the ******, ***** **** also *** ** ******* a ***** ** **** DIY *******, *** ***** outlook. **** *********** ***** ***** positive ******* ** * current ******* ** ********, or ********* *** ********* they **** **** **** success ** **** * sure *****. "******** - ** **** end **** **** **** the **** **** *** of ******** ***** ****." "*** ******* *** **** is **** ********. ** already **** * *********** pipeline ** ************* *** 2018, ********** ** *** higher ****** ******** ******." "********. ** **** *** a **** **** ** security **** *** *** and ******** ********* ** Boston ****. ******** ********* budgets *** **** *** up ** **% ** value **** **** * years." "********. ****** **** ** 2017, **** ******* ********** half ** ********* *****." "******** ... ****** ******* our ***** ***** **** a ********* ******** **** 2018." "********. ** *** ******* behind ** ******** *** have **** **** ** chose *** ** **** bid." "********......**** ******* ** ****** to ** ****** *********** and ******** *** ******* ACS *** ** ****** systems." "******** ** ** **** some ******* ******** *** quality ** ******** ***** a ***** *** ******** on **** ****** ******** where ** *** *******." "******** - **** ** work **** ** *** pushing **** **** ******* of *** **** ** are." "**** ******** *** ******** based ** *** ******** we **** *** ****." "********. ****** *** ** our ***** ********* **** sent **** **** *********. We **** ** **** busy." "*** ******* *** **** is ********, ** ** have ******* ******* ***** law *********** ******** *** upcoming ********." "********. *** ******** *** never ******* *******. * major ******* ** *** business ** ******** ********. The **** ** *** focus ** **** ***** are ******* ********* ** integrators. **’** ***** *****’* a *** ** ***** to ** *** **** SMBs ** *** **** how ** **** **. This *** ****** ** to **** *****. ** do *** **** ** big ******** ** **** us ****** *******." "********. ** ****** ** **** more *********** ********* *** the **** ****. ***** are **** *********** *** further ****** ** *** EU *******." "********. *** ********, ********** level ***** **** ** be ********** **** ** the ***** ******** ****** decreases. ** ******* **'** pretty **** ********* ********** and *********** **** ** compete ** **** *****." "*******, ********. ******* ********* will ** *******. * lot ** ****** ** healthcare *** ***********." "******** - ** *** extremely ****. ** ** yrs ** ********, * have ***** **** *** market ** ****. **** of *** ************ ** our ***********. *** ** my *********** *** **** also"
"* ***** **** **** be ******** ******* *** us. **'** ****** ********* increasing ** **** ** our ****** *** ** hope ******** ***** **** the ******** ****." "********. ** **** * lot ** *** ************ projects ******* ** ****, all ** ***** ******* IP *******, *******, *** A/V." "**** ********. *** ******* is ****** *** ******* the **** *** ******* business ******* ** ******"
"** ** ******** ******* the ******* ** ****** and, ******** **** ********** is ******** ******* ****. For *******, ********* *** delivering **** ** ********** promised." "********, ******* ** ****** is ****** *** ***-***** are ****** **** ***** secure ********* *** *** also ******* *** **** information ***** ****-***** ***** etc"
"**** ********. * **** the ******** ** ** the ***** ** * technology **** **** ****** recognition, ***** **********, *** video *********. ** *** do ** **** **** with *** *********** *** that ** ***** ** the ****. "**** ** ********. * believe *** ******** ******** will ******** ** **** with *** ******* **** products. "* ***** ** **** be ********. * ** looking ******* ** ******** technology *** **********. ** it ***** ** *******, that ***** ** * game *******. * *** a **** ** ********* and *** ** **** systems. *'* ******* ** see **** ******* **** do **** ** ******** Wave." "********. * ***** ********* are ***** ** ***** really ******* **** ****** with **** ***********." "********. *** ************, ** Camera ******* *** ******** in ******** *** **********." "** ** ****** ********. I **** **** *** products *** ********* ** a **** **** *** the ****** *** ******** just ***** ** ******** every ****." "********. ** *** ******** new *** ********* ******** to **** ** ***** out ** *** ***** market." "**** ***** *****! ***** are *** ******** **** will ***** ******** ******** with ***** ****. ******* in **** **** ******** is ******** *******." "********. * *** ** new ************ *** ******** the ****** ** ****** we *** ******." "*******. ***** ** *** a *** ** ********** innovation, *** ******** ******** seems ** ** ********** to ********." "*******. * ***** *** next ***** **** **** be ********* *** ***** are *** **** ***** options ***." "*******. * ***'* *** any '**** ********' ************ on *** ******* **** will ************* ****** *** market. * ******* ****** are ***** ** ** status ***." "*******. ****** *** ****** anything ******** ** **** stands ***." "*** ******** ****** ** going ** ******** ****** by ***** ******** ** CRIME ******"
"********. *************, *** ***** isn't ******* *** *****. Security ***** **** **** increase. **'* **** * question ** ******* **** increase ** ****** **** be ****** ** *** current ******** ********, ** if ******** ***** ******** using ******** **** ********** will." "***% ********. *** **** for ******** ** *** world ** **********. *** security ******** **** ** flourishing *** **** ***** to ****." "********, ******** **** **** with *** *** ****** in *** *****." "********, **'* * *** world *** ******** ***** cameras"
"******** ******* ***** *** criminals **********." "********. ******** ********* *** been ********* ** *** last *** ***** *** continue ** ******** ** coming *****. **** ******** access *******, ***** ************ and ********* *** **** Integrations." "********. *** **** ******** world ********** ******** *** tensions ** *** ** will **** ******** ** grow *** ********." "*******....******* *********** *** ************ but **** ** *** bottom ******** * ****** to *******." "*******. ******* ** *** what ******* **** ***** foreign *******." "*******. ***** *** ***** of *** *** ****** growth ** **** ** further ******* ********** ****** things **** ********* ** sell. ** *** ***** hand *** ******** **** to **** ** ******* awareness ** ******** *** the ******** **** ** others ***’** ****** **** DIY ****." "******* - ** *** getting ******, *** ****** to **** ***** ** jobs. *** **** ******* are ****** ******* *** 2016. ***** **** ***** for *** **** ** years ** *** *********." "*******. * *** ********** increase ** *** ****/****** for ********, *** ** the ******* ********* ** struggle *** **** ******* out ***** **** ************ going ********** **** ******* & ****** ***** ** end-users, **** ***** *** an ************ *********** ******. All ********** *** ********** to ******** ******* **** year, ******* ******* *** more ******** ** **** out ***** ***** **********. Additionally, ** ******** ******* are **** ********* ** the ********, **** ****** less ****** ** ** see **** *** *********, Dahua *** ******* *****." "*******. **** ** ********* are ****** ******** *** hardware **********. ** *** still ******* ******* ******** on **** ** ***** deals (** * *******). More *** ******** ** the ******. ** *** shifting **** **** ********* like ****, *** ****** to ***** ** ***** that **** ***** ** an **********." "**'* *** **** ********- there ** * *** of *** ***** ***********, concerns ***** *** ******** in ******* ** ******* to ******* ******** *** have *** * *** projects ****** *** ** their ******** ***** ****** they ***** ***** ******, hacking, ***." "********. ********* *** ***** for ***-**** ********* ******** the ***** ** ****"
"********. **** ** * ‘Race ** *** ******’ with ***** **** ********"
**** ******, *** *** **** ******* ** **** ******** ******. It ***** *** **** ****** ** **** **** ******. * feel *** *********** ********* ** *** **** *** ***** ******** markets. * **** **** ** **** *****, *** **** *****'* mean ******** ********** **** ** *** ****. **'** ***** ****, **** ****** *** ** *** *********** *********, home ***** *** ********* ************, ***** ** ** ********* ** more ** ** ******** *** ****** ******* *******. ******* ** anyone **** ** **** ****** **** *** **** *****.